View this video to better understand the relationship between posture, breathing, and good health. Roger Price developed The Breathing Well program was developed to address problems caused by dysfunctional breathing and posture which typically develop due to the 21st century lifestyle. It’s time to retrain your body to optimize oxygen delivery. Join the instructional program. 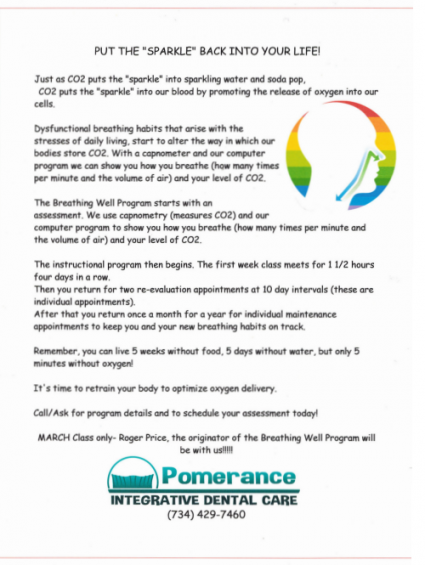 In the March class only, Roger Price, the originator of The Breathing Well Program will be a special guest! Health issues that can typically be improved with this program include asthma, snoring and sleep apnoea, high blood pressure, bed wetting in children, night time toilet trips in adults, digestive disorders, anxiety, and more! The program goes to the root causes of the symptoms to ensure that you are breathing better. Visit airwayhealth.org for more info. 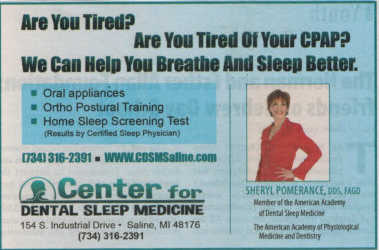 We offer training that can help you breathe and sleep better. This unique center in Saline, MI, provides upper airway screening, development and management for children and adults. We treat Obstructive Sleep Apnea, snoring, jaw joint and muscle pain, intergrative dental, and malocclusion (bad bite). If you ask most people why we breathe, they’ll say to bring in oxygen. It’s commonly believed that only oxygen is requires for our health, and that carbon dioxide is just a waste of gas. The truth is carbon dioxide is just as important for our health as oxygen. We don’t exhale to get rid of carbon dioxide. We exhale to regulate the amount of carbon dioxide in our bodies. There is an optimal level of carbon dioxide that our bodies try to achieve. Too much or too little can be a problem. Breathing too fast or deep eliminates excessive carbon dioxide, and this has some serious consequences for our health. Here’s a simple way to prove this fact. If you were to breathe as fast as you can for the next 60 seconds, then you will find yourself getting dizzy, your fingers and lips will start to tingle and you might feel like you are going to pass out. Now, why does this happen? Shouldn’t you have felt invigorated? Didn’t all that breathing increase your oxygen supply? Why do you feel worse? Here’s what actually occurred. The rapid breathing brought in lots of oxygen, but made you lose too much carbon dioxide, and it was this loss of carbon dioxide that made you feel ill.
One of the many things, that carbon dioxide does, is help oxygen get released into the cells. Without enough carbon dioxide, we actually become oxygen deficient as well. When you take a breath of air, oxygen enters your lungs, where it’s attracted to the hemoglobin in your red blood cells. This oxygen rich blood is them pumped by your heart to the rest of the body. But did you ever wonder how the oxygen gets out of the blood and into the tissue? If oxygen is so attracted to the red blood cells in the first place, why would it ever let go? The answer is carbon dioxide. Blood can’t just drop the oxygen off; it EXCHANGES the oxygen for carbon dioxide. Now what if there isn’t enough carbon dioxide to do the oxygen exchange? When this happens, the oxygen is forced to stay in the blood. It never releases into the tissues. The more you breathe, the more breathless you feel. You end up with healthy red blood, full of oxygen that never gets released into the tissues. It’s useless. So, a carbon dioxide deficiency gives you an oxygen deficiency. The faster you breathe, the less oxygen you get! Carbon dioxide is required for the availability of oxygen. How can carbon dioxide affect our immune system? Every day we’re exposed to viruses and bacteria. With the advent of jet travel, and infection in a Hong Kong market, can be in a New York coffee shop in 24 hours. Our first line of defense is our white blood cells. When a white blood cell finds a foreign invader in the body, its job is to attack the infection, and then to make antibodies to let other white blood cells know about the infection so they can get involved too. Scientific research has shown that carbon dioxide not only helps these white blood cells move faster and attack well, it also helps these white blood cells make more antibodies. In other words, carbon dioxide makes your immune system stronger and faster, and better able to recognize these infections. These sticky proteins are supposed to be attached to carbon dioxide. When they are, they’re protected. But what happens if there isn’t enough carbon dioxide available to attach to them? In the absence of carbon dioxide, these sticky proteins attach to the sugar in our bloodstream. Now sugar attached to a protein is worse than useless, it is toxic. Not only are these proteins no longer functional, they are waste products that have to be removed from the body. This is a problem because proteins are essential components. Although there are thousands and thousands of different proteins in the body, each with their own special job to do, let’s just look at 5 groups of them: The structural proteins, hormones, neurotransmitters, enzymes and antibodies. Structural proteins are the proteins that we use to grow and to repair ourselves. Take skin for instance. Without enough carbon dioxide to keep the structural proteins available, the skin won’t be able to repair itself properly. Instead of making healthy new skin when the old skin wears out, the skin will get filled with toxic protein-sugar complexes. You can see this happen as you get older. Age spots, also known as liver spots are examples of these toxic accumulations. Of course, age spots don’t just show up in the skin, they accumulate throughout the body in places like the heart, the brain and other internal organs. If you can see them in your skin, you can be sure that they are on the inside of your body as well. The next group of proteins are the hormones. Hormones are chemical messengers that help the body communicate with itself. Take insulin for example. Insulin is a hormone made in the pancreas that tells the cells of the body to open up and let glucose in so they can make energy. Now what happens if the insulin protein gets a sugar molecule stuck to it instead of carbon dioxide? When this happens, the insulin can’t work properly. Without insulin, the cells can’t get the fuel they need, so the pancreas makes more insulin and the liver releases more sugar into the bloodstream. This additional insulin only gets more stuck with the additional sugar just released, all the while cells are starving and losing energy. If this goes on long enough, there is a clinical name for it, diabetes. There are thousands of hormones in the body that help keep things organized. Diabetes is what happens when just one hormone doesn’t work properly. Can you imagine what happens when all of the hormones start to gradually fail? Of course some people try to fight the aging process by taking additional hormones, but this doesn’t solve the problem. Without the carbon dioxide to protect them, these additional hormones just get stuck to sugar losing their effectiveness and making more toxins. Taking a look at the third group, neurotransmitters, are the chemicals that the brain uses to think and to feel. Dopamine gives us drive and ambition, serotonin gives us happiness and peace of mind, and melatonin helps us sleep and keeps our brain healthy. There are just a few examples. When these neurotransmitters attach to sugar instead of carbon dioxide, they not only keep us from being as smart and as happy as we can be, they also end up forming deposits in the brain itself. Having adequate levels of carbon dioxide allows us to make better use of our neurotransmitters and keeps our brains healthier longer. Enzymes are another group of proteins in the body. There are thousands of different enzymes in the body with more being discovered every day. Just consider the ones you’re probably most familiar with, the digestive enzymes. Without enough CARBON DIOXIDE to protect these digestive enzymes, the ability to digest food gets weaker and weaker until we only absorb a fraction of the nutrition that we actually eat. We want more and more food, but absorb less and less of it. Without proper digestion, we can have neither the energy nor the raw materials to function properly. By protecting your enzymes with carbon dioxide, digestion is well maintained. The last group of proteins mentioned are the antibodies. Antibodies are special proteins that our immune system uses to identify infections. When white blood cells find an infection, they destroy it. Still the immune system knows that while it may have killed this one bug, there are more of the same kind of bug elsewhere in the body, so it makes special proteins called antibodies to let the other white blood cells know what to look for. Now, rather than having to wait to bump into an infection at random, the white blood cells have a head start. If you have enough carbon dioxide to keep your antibodies protected, then your immune system can often destroy an infection without you even knowing it’s there. If on the other hand, your antibodies get stuck to sugar instead of carbon dioxide, the antibodies won’t be able to do their job as well. An infection, that might have taken hours to clear up, now can take days or weeks. Carbon dioxide is involved with more than just the protection or proteins. It is also involved with their removal as well. When a protein reaches the end of its useful life, it turns into ammonia. When there’s enough carbon dioxide available, it combines with the ammonia to form urea, which is harmlessly removed from the body. Should the carbon dioxide be in short supply, ammonia builds up. Some of the symptoms of ammonia toxicity include tremors, fatigue and aversion to high protein foods. If the ammonia levels get high enough, it can damage brain cells. We make ammonia every day. Only carbon dioxide stands between us and this chemicals damaging effects. Some other ways that carbon dioxide helps us besides protecting and detoxifying proteins is that carbon dioxide is also one of the main ways that the body relaxes. It’s nature’s tranquilizer. When there’s enough carbon dioxide in the body, muscles relax. On the other hand, when there’s not enough carbon dioxide in the body, muscles contract. Now there are 2 separate muscle systems in the body, the voluntary and the involuntary muscles. The voluntary muscles are the ones that we have control over, like those found in our arms and legs. We use them to walk, to talk and to move about. The involuntary muscles we have no direct control over. These muscles are found in our internal organs. When voluntary muscles get overly contracted, it’s obvious, they hurt. When the involuntary muscles get overly contracted however, all kinds of symptoms can occur that you would never associate with muscle cramps. What happens when the involuntary muscles of the body get overly contracted? When the muscles that line the arteries of our brain cramp, blood flow to the brain diminishes. This can result in symptoms ranging from headaches and poor memory, to fatigue, poor eyesight, poor hearing depression and even stroke. Moving down; when the muscles in the throat cramp, you can have difficulty with speech, swallowing food, snoring and sleep apnea. Continuing on, when the muscles in the lungs cramp you get asthma and breathing problems. Now the heart is an involuntary muscle too, so when the heart muscle cramps, it causes angina, and if the cramp is bad enough, it can cause a heart attack. Moving on, the length of the digestive tract is lined with involuntary muscle tissue. If the stomach cramps, you can get gastric reflux, if the gall bladder cramps, you can get gallstones, and if the colon cramps you can get constipation or spastic colon. Muscles also line the bladder, so a cramp here causes incontinence. When the muscles of the uterus cramp, you get menstrual cramps and if the muscles that control a man’s reproductive organs cramp, you get impotence. Many of the conditions that we medicate ourselves for are really nothing more complicated than muscle cramps. In addition to relaxing our muscles, carbon dioxide also helps us relax our minds as well. Our minds are constantly active; wondering, thinking, and remembering. Even when we’re asleep, our brains are active in our dreams. But have you ever tried not to think of anything. It’s almost impossible to do for more than a second or two. It’s our capacity for thought that makes us human, but too much thinking can drive us crazy. Have you ever tried to go to sleep, but you just couldn’t stop thinking about one thing or another? That’s one example of what happens when the brain can’t turn off. The problem starts when we run low on carbon dioxide. You see, it’s carbon dioxide that lets the cells in our brains turn off when they’re not needed. When carbon dioxide begins to run low, these brain cells can’t turn themselves off. They stay on, whether we want them to or not. This causes two problems. First, brain cells aren’t designed for non-stop use. They need to rest and recuperate. When they stay on too long from lack of carbon dioxide, they wear out more quickly. This causes our brains to age faster than they would normally. Secondly, hyperactive brain activity can cause physical and psychological problems, such as difficulty concentrating, chronic fear and anxiety, muscle twitches and insomnia. The secret to a more peaceful and relaxed mind isn’t hidden away in some distant mountain sanctuary, it’s in the way you breathe. If you’re like most people who ignore their breathing by leaving it on auto pilot, you’re probably breathe about 18 times a minute. The optimal breathing rate is closer to 8 times a minute. Most humans breathe twice as quickly as they should. But if breathing slower is better for us, why do we breathe faster in the first place? The answer is stress. Every time we get stressed, we breathe faster. That’s just the way our bodies are made. Now if our lives were mostly calm and peaceful, a few stresses could come and go without causing much harm. In today’s world, stress is continuous with such things as: traffic jams, bills, arguments, pollution, food additives, medications, illnesses/injury, emotions, world affairs, caffeine, etc. All this contributes to keeping our breathing rate high, and over time our brains reset themselves to this faster breathing rate. Now, even without the stress, our breathing rate is elevated. So, finally ask the question: How do we slow our breathing rate down an increase our carbon dioxide levels? The secret is simple to reset your body’s natural breathing rate: Buteyko breathing techniques. Pomerance Integrative Dental Care provides breathing re-training based upon the principles of Buteyko Breathing. Whereas stress causes you to breathe faster and faster, carbon dioxide calms you down and lets you breathe slower. In addition to the long term benefits of lowering your breathing rate and raising your carbon dioxide levels, you also get certain immediate effects, such as more relaxed muscles and a calmer mind to the effect is quite pleasant. In summary, carbon dioxide is required for the delivery of oxygen into our bodies, the efficiency of our immune system and the synthesis, regulation and detoxification of protein such as hormones, neurotransmitters enzymes and antibodies. Carbon dioxide is one of the main ways that the body relaxes its muscles, brain and nervous systems. But this is just the tip of the iceberg. Carbon dioxide is also one of the body’s most powerful antioxidants. It’s the main way that our body maintains its important acid-alkaline balance, it helps stimulate fat loss and muscle gain, it decreases allergies and reduces inflammation. 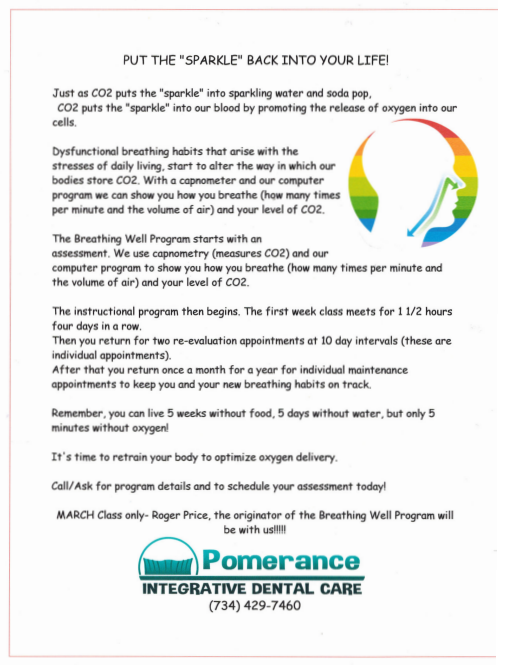 To find out if you have appropriate levels of CO2 in your body contact Pomerance Integrative Dental Care at 734-429-7460 to schedule an appointment.